I have really begun to enjoy still life photography over the last few months. I think as my son has become more active still life photography has given me a calm place to take a deep breath and be creative. I have several still life photos from this quarter, so it was hard to pick a favorite. I chose this photo, because it reminds me of my granny. As many of you know, my maternal grandmother passed away earlier in the week. 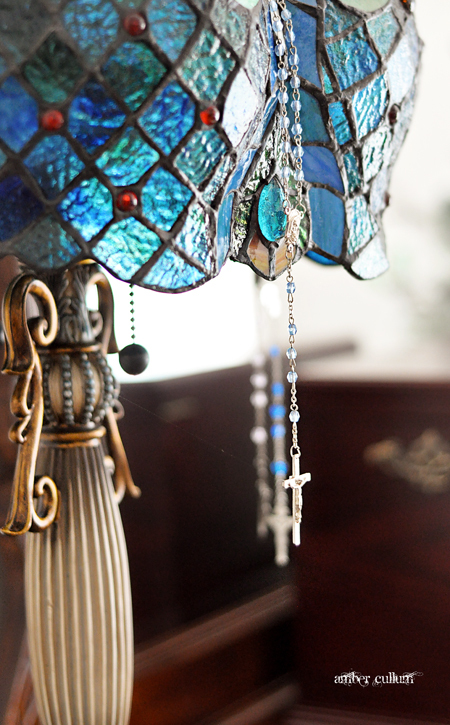 These rosaries have hung from this lamp in her bedroom for years. She may not have been Catholic, but she loved Jesus and always adored these rosaries. The morning after her funeral I was walking around the house with my camera in tow. I fell in love with the way the light was falling on the body of Christ and something about the single strand cob web reminded me of the amount of time it had been since my granny had visited those rosaries. I am entering this photo in Branson, Courtney K., and Courtney N.'s new still life challenge. Be sure to head over and check out the other entries. You can join while you are there. That is a beautiful lamp and my condolences to your family for your loss. The photo is breathtaking and does speak a lot in so little as well. Beautiful shot, Amber. I know that encompasses so much love and memory for you of your Granny. So sorry for your loss this week, but so glad you are able to capture details like this of her life. A beautiful shot, and a beautiful story that coordinates with it. I'm so, so sorry about your grandmother. You guys will definitely be in our prayers! Thanks for joining us in the linkup! I'm so sorry to hear about your grandmother's passing. I lost mine almost 2 years ago and I still miss her terribly. This shot is so beautiful! Thank you for telling the story. Makes it so special. Prayers of peace for you! This is gorgeous Amber - what a beautiful reminder! I'm so sorry you no longer have your grandmother here with you. My great grandma died 15 years ago and I miss her a lot still, but what a joyous thing to meet Jesus face to face! My grandma WAS catholic, and this photo made me cry this morning. It is beautiful. So simple, yet so detailed. I'm sorry for your loss.